We have special Combo menu for Men! Supports the rejuvenation of your hair and scalp. Combats thinning hair and hair loss, restores your hair and scalp to a healthy state, and gets you closer to your ideal hairstyle. 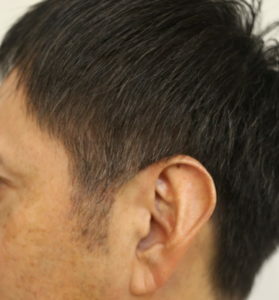 Thinning hair or hair loss. Decreased volume in your hair. Decreased firmness and thickness in your hair. Redness in your scalp or scalp psoriasis. Dandruff, sebum buildup or odor. 2 We examine your scalp with a 1000X microscope. Using a specialized oil, we massage your scalp and remove any hardened impurities stuck to the hair and lipids that have accumulated in the pores so deeply that they cannot be washed away with normal shampoo. We massage your scalp with a specialized shampoo full of ingredients that add essential moisture and nutrients to your scalp and pores. This is a specialized conditioner full of ingredients that add essential moisture and nutrients to your scalp and pores. By massaging and relieving tension and stiffness from the frontal, temporal, and occipital muscles in your head, we improve the lymphatic flow and help reinvigorate the inner skin cells on your scalp. We take into account the amount and flow of your hair as well the bone structure of your face. We will recommend a natural hairstyle that best compliments your own hair and its characteristics and tendencies. ＊The head spa works best not as a one-time treatment, but rather as a repeated application through which you can experience improved hair and scalp health. Here at Nagi, we recommend coming for this treatment every 3-6 weeks. Recommended for customers who are short on time or who just want a sample experience. 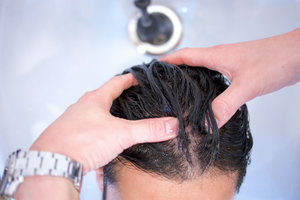 This is a quick head spa that uses carbonated spring materials. Using the cleansing power of carbonation, this clears away old lipids and dead cuticles that have built up in your pores and can’t be removed with regular shampooing. A natural color solution designed for men to blend their gray hair into non-gray hair. Gray hair gets blended into the non-gray hair in a very subtle way that is less noticeable and also adds youthful appeal to mature men. 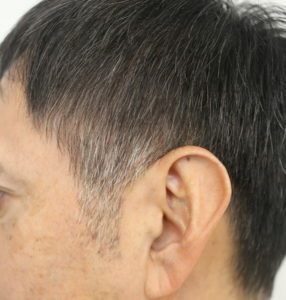 Bokashi color doesn’t hide gray or white hair by completely dyeing it over. 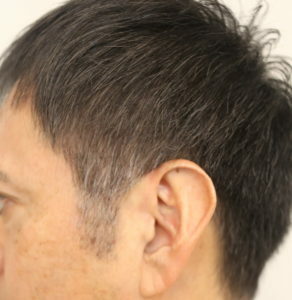 Rather, it enhances the gray hair by “blurring” the lines between the gray hair and non-gray hair so that they are less pronounced. Customers who are bothered by their gray hair but don’t want to dye it all one color. Customers who don’t like the reddish brown shade that often occurs when dying gray hair a darker color. Men who want to give their gray hair a look that is natural and age-appropriate. Men who don’t want their gray hair to stand out but also don’t want to appear like they are trying to look artificially younger. Men who want to color their hair without others knowing about it. 2 Apply Bokashi color at the shampoo station. Control the length of color setting time based on desired shade. We use shampoo and conditioner designed for color-treated hair. 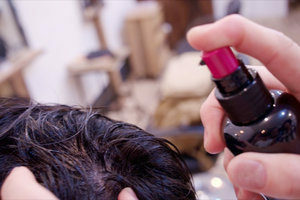 We will offer advice about styling products and methods. ＊Bokashi color is different from typical hair color in that it is a natural blending color and therefore fades sooner than normal hair color. For optimal style maintenance, we recommend regular salon visits.